I’m a lifelong football fan – lifelong Denver Broncos fan. So, Super Bowl Sunday is a holiday in my house. When I tell my daughter that it’s my favorite day of the year, she gets upset, telling me I should choose her birthday. “That day is also in my top five,” I say, which makes her crazy. I mention the Super Bowl because days like this make me feel like a winner. I didn’t bet on the Packers. However, I did get to watch the game at home with my wife, daughter, and closest friend, who has watched the last 16 Super Bowls with me. That is a winning day, my friends, because I didn’t cough up blood and I wasn’t in the hospital. I also got to watch another Super Bowl. Though that may seem like a given for some, I can’t be sure that I’ll be around to watch next year’s – I’m not taking anything for granted. Milestones matter. My daughter turns 9 soon, and I’ll cherish the fact that I’m here to see her ninth birthday, though I don’t want to jinx myself. There is always the chance I’ll have to celebrate the actual day while I’m in the hospital. Here’s how superstitious and strange I am. 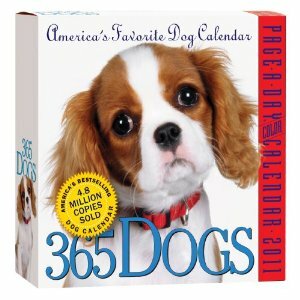 I have a 365 Dogs calendar. Each day, I rip one page off of it (except weekends with two days on one page). I do not tear a page off until the actual day arrives. I am afraid to remove the page the night before lest it causes me not to live through the night to see the day – punishment for my overconfidence of looking ahead. Yes, it’s not easy being me. Even now I worry about waking up healthy tomorrow, as every time I blog about a good day, I get punished by CF. If I’m lucky, CF will skip this post and I’ll escape its curse of sharing good days. We’ll see. I have a bag packed just in case. 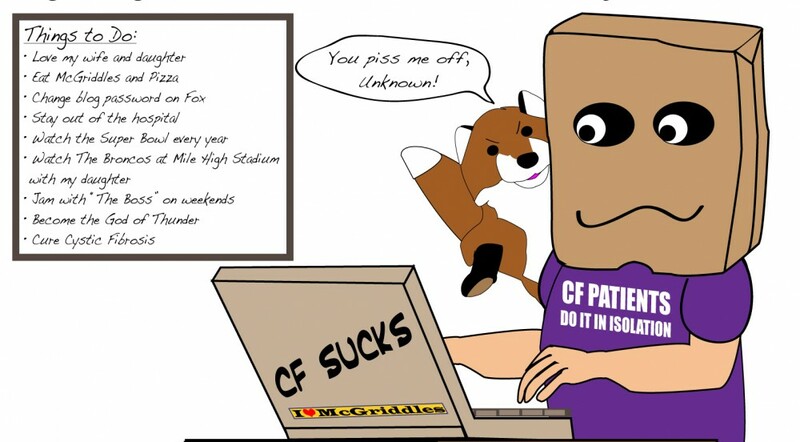 This entry was posted in cystic fibrosis, Fun & Humor and tagged cystic fibrosis, fighting cf, Super Bowl, time by unknowncystic. Bookmark the permalink. Here’s to Super Bowl XLVI, my fellow Broncos Buddy. Here’s to your birthday and the Broncos winning the Super Bowl next year.